“Railway Stations: Go into ecstasies over them, and cite them as architectural wonders.” (“Gares de chemin de fer: S'extasier devant elles et les donner comme mod�les d'architecture.”) — Flaubert, Le dictionnaire des idées reçues [The dictionary of received ideas] — never completed and invariably published with Bouvard and Pécuchet, which was also unfinished. The dictionary is an assemblage of popular opinions — cited as examples of bourgeois crassness. But here we must agree with those who were the butts of Flaubert’s humour. 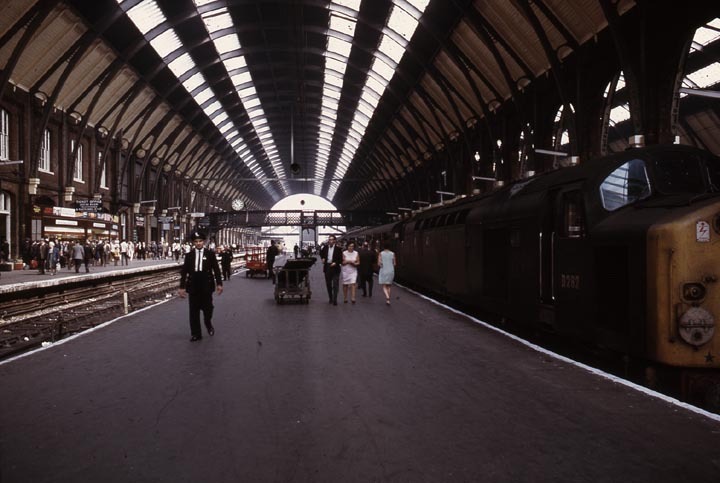 Euston was the first of the great stations. With it began the era of competitive station building in capital cities. The London & Birmingham Railway started services between the two cities in 1837. The railway reduced the arduous twelve hour coach journey from London to Birmingham to less than half — the current journey time is an hour and thirty minutes. Such a transformation in society was celebrated with a new kind of architecture. The train sheds, however, were modest, economical, structures. They were designed by Robert Stephenson, the son of George Stephenson, and the Chief Engineer of the railway, and Charles Fox, the son of a prominent sugeon. Fox went on to have a distinguished career as a civil and mechanical engineer. Passengers arriving at Euston could step out from trains straight into carriages waiting immediately outside the train sheds. 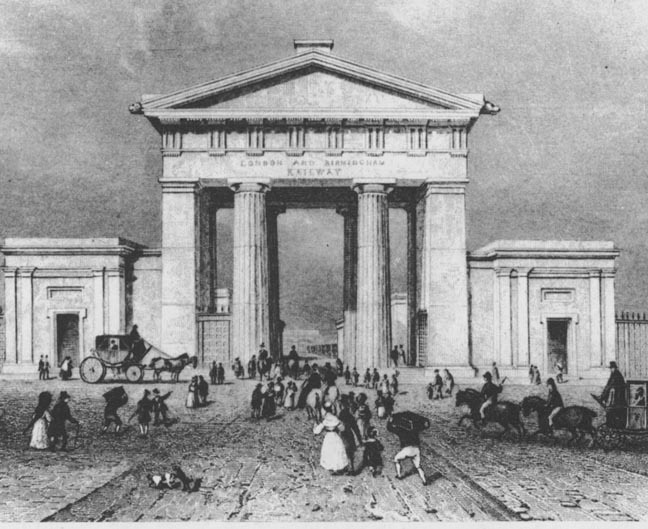 Departing passengers would pass through the grand Propylaeum, the entry to a temple complex — the affectionately remembered Euston Arch. Its stern Greek Doric columns were almost 13 metres tall. It was destroyed, in act of philistinism, or wilful vandalism, by British Railways in 1962. 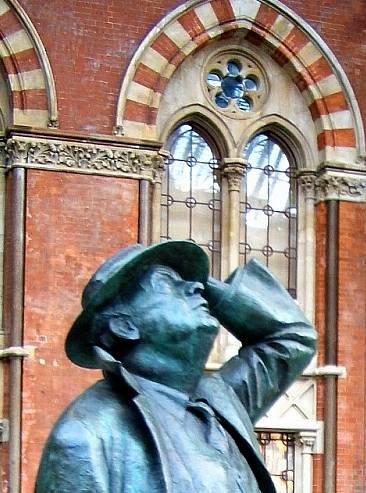 Sir John Betjeman by Martin Jennings in St. Pancras. The episode aroused violent controversy, and protests were led by John Betjeman. London County Council in which the Royal Fine Art Commission also joined in. Although the battle was lost conservation was to become an increasing part of architectural debate. The wrought iron gates to old Euston have been preserved and are to be found in the National Railway Museum at York. There are some simple stations between Lancaster and Carlisle which have always struck me as the best stations of the smaller kind I have seen in England. They are perfectly plain and unpretending and in the style of the old cottages in stone districts. I do not know whether the great station at Carlisle was by the same hand: if so, it is a notable instance of a person who succeeds well in small things failing in larger ones. I must except . . . the refreshment-room which is like an old dining-hall on a small scale. Tite was indeed the designer of Carlisle Station (completed in 1847) as he was of Carnforth, which was completed same year. (Carnforth is featured in David Lean’s 1945 film Brief Encounter, with Celia Johnson and Trevor Howard.) Tite was an extremely versatile architect and was at one time President of the Royal Institute of British Architects. In his latter years he was a Liberal Member of Parliament. Christopher Wren’s son inscribed upon his father’s tomb in St Paul’s “Lector, si monumentum requiris, circumspice,” [“Reader, if you seek his monument, look about you”]. The Great Western Railway is Brunel’s monument. A railway is infinitely complex — calling for prowess in both civil and mechanical engineering, to say nothing of artistry. And Brunel had the imagination of an artist. He was responsible for building over a thousand miles of track. The gauge of his track was 7-foot-and-a-quarter inch. As trains could be more stable than with a narrower gauge, high speeds could be attained — speeds of 60 mph were commonplace, locomotives were more powerful,; since they had bigger boilers, railway carriages could accommodate more passengers in greater comfort, freight trains could carry more . . . For all its advantages, the broad gauge was not adopted nationally. The last broad gauge train ran on May 22nd 1892. The proudly independent Great Western had finally to conform to the standard gauge used by the other railways — 4-feet 8-and-a-half inches. The designer of Brunel’s locomotives was Daniel Gooch (1816-89), who is, for many, the greatest locomotive designer of the century. Then there were Brunel’s ships — the SS Great Western (1837), the SS Great Britain (1843) — the first screw propelled ship to cross the Atlantic — and the Great Eastern, it had a length of just over 207 metres and a breadth of just over 25 metres. The Great Eastern could reach a speed of almost 20 miles an hour. Here is Brunel writing to Matthew Digby Wyatt on Paddington — months before the completion of Paxton’s Crystal Palace , which housed the Great Exhibition of 1851. The colour scheme of Paddington — long since vanished — was by the architect, historian and theoretician, Owen Jones, who was responsible for the colouring of Paxton’s Crystal Palace. Jones, whose stature has yet to be fully recognised, was as progressive as Brunel. He moved in advanced intellectual circles and was a close friend of the novelist George Eliot (Marian Evans, 1819-80) and her consort George Henry Lewes (1817-78), the writer and biographer of Goethe. Matthew Digby Wyatt was a successful architect — Secretary of the Great Exhibition and Surveyor of the East India Company. He was also, in an era when art history was an emerging discipline, the first Slade Professor of Fine Art at Cambridge. Like Owen Jones he was an accomplished designer and, indeed closely associated with Jones. 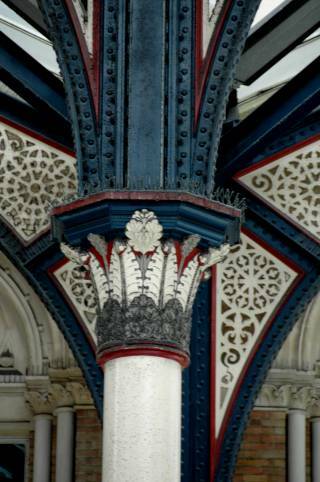 It is not difficult to detect the influence of Jones in the Moorish cast-iron capitals at Paddington. Jones’ first great publication — the monumental two volume Alhambra, London, 1836-45, being the inspiration. New Street has always been the busiest of provincial British stations. Cowper’s station was entirely re-built by British Railways in the mid 1960s when the West Coast Main Line was electrified. It is a bland, efficient station of no substantial architectural interest. At 211 feet (64.31m.) 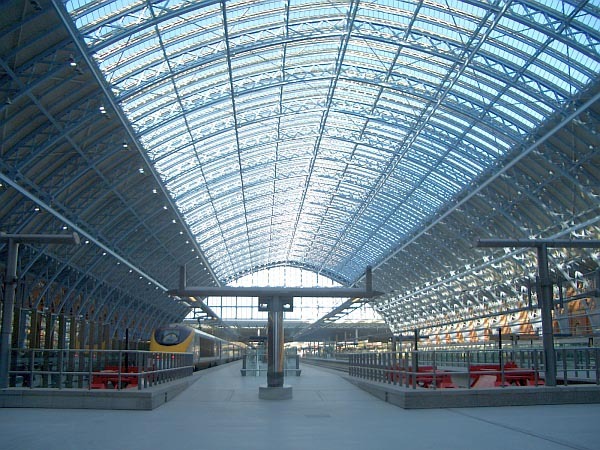 Cowper’s original wrought iron and glass roof had the largest single span anywhere — until it was surpassed by Barlow’s and Ordish’s St Pancras train shed at 243 feet (74.07m.) completed in 1867. New Street was constructed by Messrs. Fox, Henderson & Co. for whom Cowper had worked — he had been responsible for the company’s contract drawings for Joseph Paxton’s 1851 Crystal Palace. 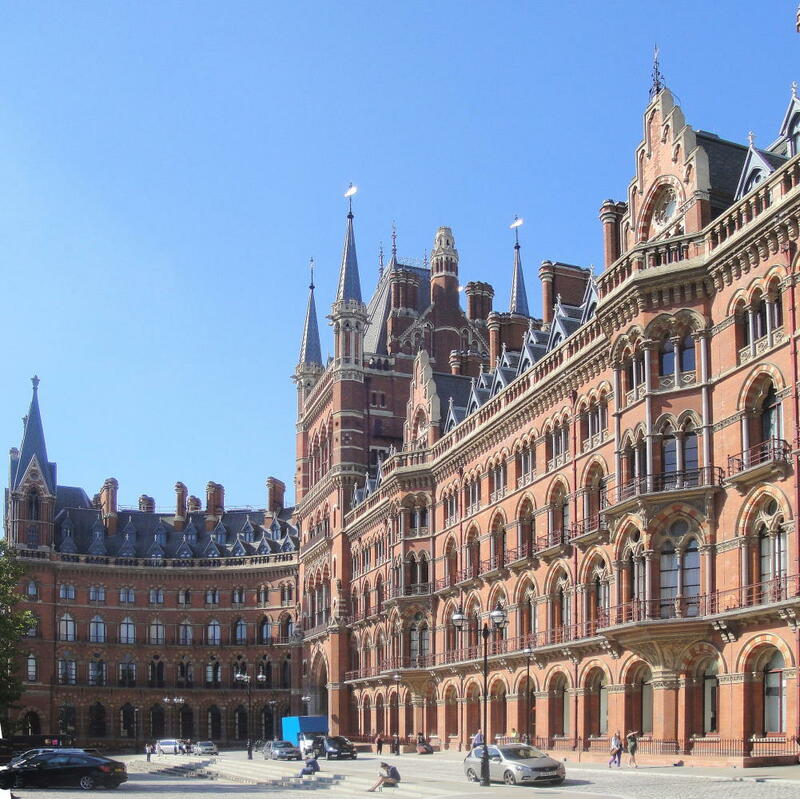 George Gilbert Scott praised New Street in Secular and Domestic Architecture (1857): “An iron roof in its most normal condition is too spider-like a structure to be handsome, but with a very little attention this defect is obviated. The most wonderful specimen, probably, is that at the great Birmingham Station . . . ” Cowper was among the leading figures from what L T C Rolt described as a “brief heroic age of engineering”. He was the son of a professor of engineering at King’s College, London. At fourteen he began a seven-year apprenticeship with John Braithwaite (1797-1870) — a successful civil engineer. While still an apprentice he devised a system of railway signalling by means of small detonators — which made a load bang when a train passed over them. These were widely used in fog to alert engine drivers of hazards — when conventional signals could not be seen. Cowper set up on his own account as a consulting engineer in 1851. He contributed much to the development of steam technology. In 1870 he invented a device by which hand-written messages could be transmitted by telegraph without the need for the use of Morse code. Cowper was consulting engineer to the Post Office. 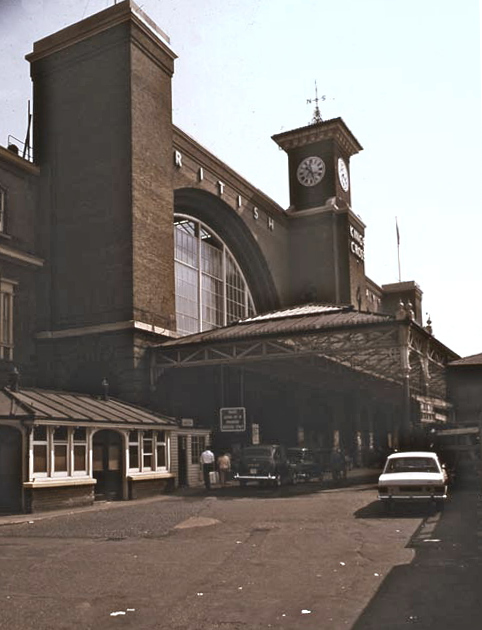 The first London terminus of the Great Eastern Railway was at Shoreditch. 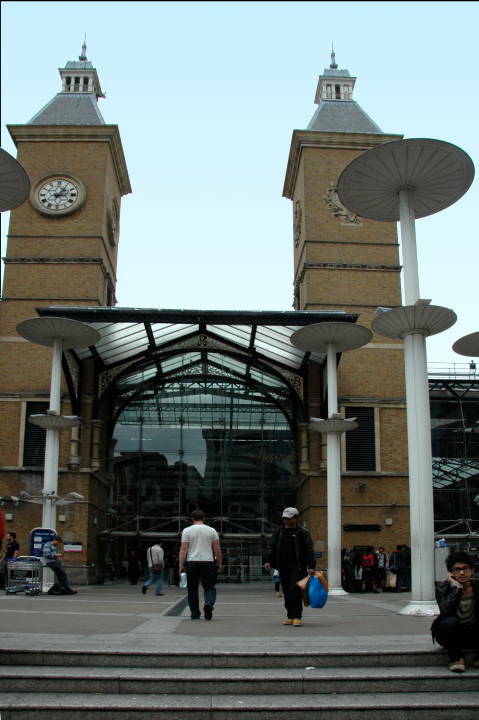 Liverpool Street was created in order to bring the railway closer into the City. A substantial part of the station’s traffic consisted of working-class commuters who came from London’s northern suburbs. In addition, Liverpool Street served East Anglia — and Harwich which was growing steadily in importance as a port. The site had been once occupied by Bethlem Hospital, where people once paid to enjoy gawping at and teasing the insane. 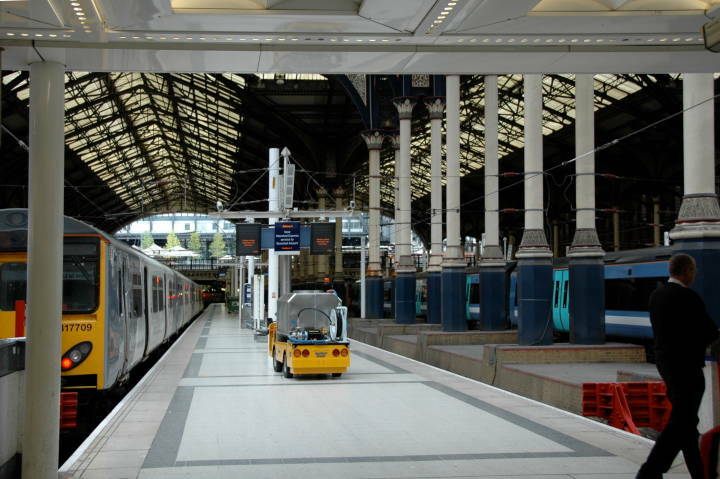 Liverpool Street takes its name after Lord Liverpool (1770-1828), the longest serving British Prime Minister. The cost of the site was considered to have been excessive at the time. And there are still the steep gradients — always to be avoided in railway construction — leading up to the station. 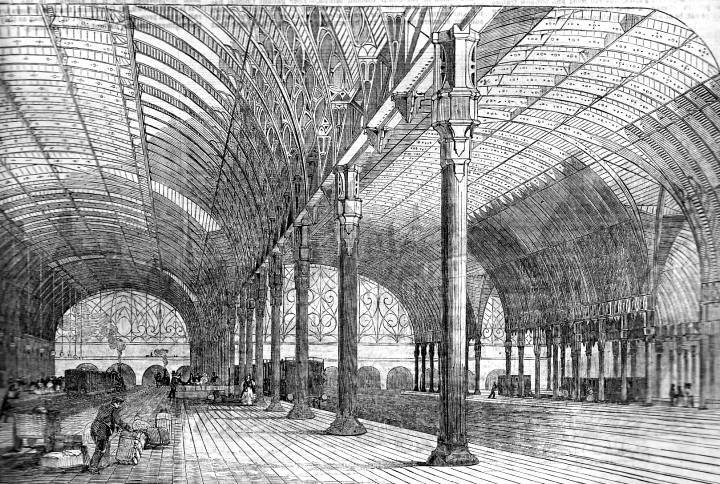 Liverpool Street perhaps lacked the architectural charisma of the old Euston, St Pancras, or Brunel’s Paddington. For all that, its ironwork, with its filigree cast iron brackets and sturdy capitals — now painted in very congenial colours — is a delight. The 1994 metamorphosis of the station by Nick Derbyshire and his team — which involved the replicating of Victorian wrought and cast iron — has given new energy to the once dowdy station. Circulation in the station which was once notoriously difficult to navigate has also been vastly improved. 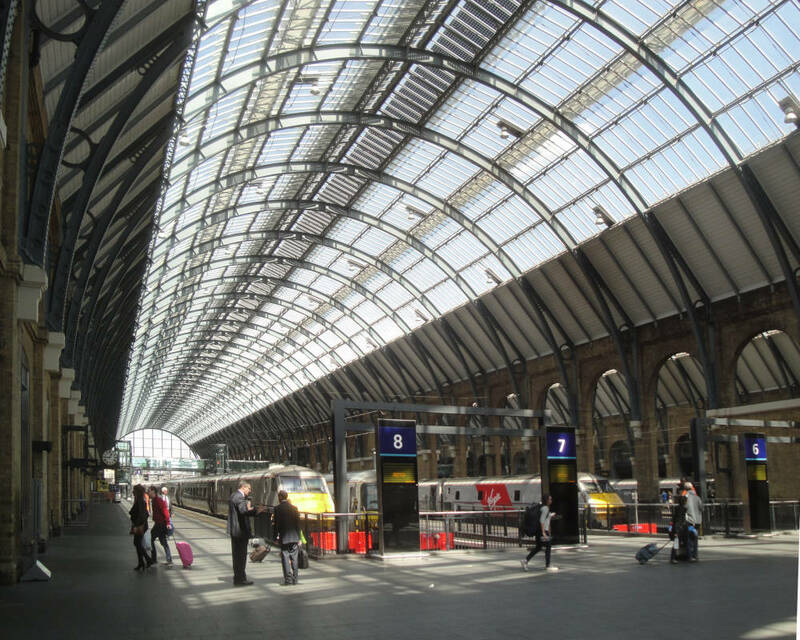 The present Liverpool Street station affirms the value of refurbishing a perfectly serviceable nineteenth structure. The Great Eastern Hotel, by Charles Barry, junior (1823-1900), the son of the architect of the Houses of Parliament, has been transformed into a boutique hotel by Conran & Partners. The station was named the Victoria Terminus on the occasion of Queen Victoria’s Jubilee in 1887. 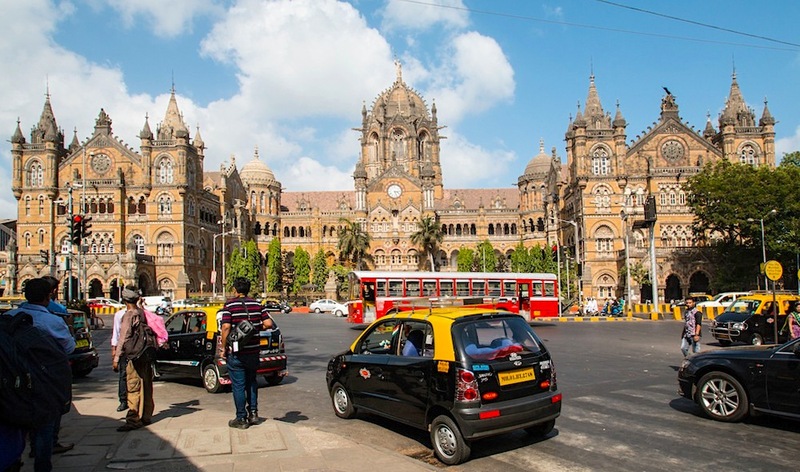 In 1996 it was renamed the Chhatrapati Shivaji Terminus in honour of Chhatrapati Shivaji (1627-80), scourge of the Mughals and founder of the Mahratta empire, which was finally extinguished by the British in the early nineteenth century. Mumbai is the capital of Maharashtra and Shivaji is the state hero. The station — the original terminus of the Central Railways — was designed by Frederick William Stevens, born in Bath, who joined the Indian Public Works Department at the age of twenty. It is said to have been influenced by George Gilbert Scott’s Gothic Midland Hotel, although it incorporates fine Indian carving and decorative features. John Lockwood Kipling (1837-1911), father of Rudyard Kipling, was Director of the Sir Jamsetjee Jeejebhoy School of Art in Bombay — the first modern art school in India. The institution promulgated the idea of amalgamating Indian and Western traditions, which was part of government policy. The Chhatrapati Shivaji Terminus was put on the UNESCO World Heritage List in 2004 — the first building of its kind. The busiest British station. 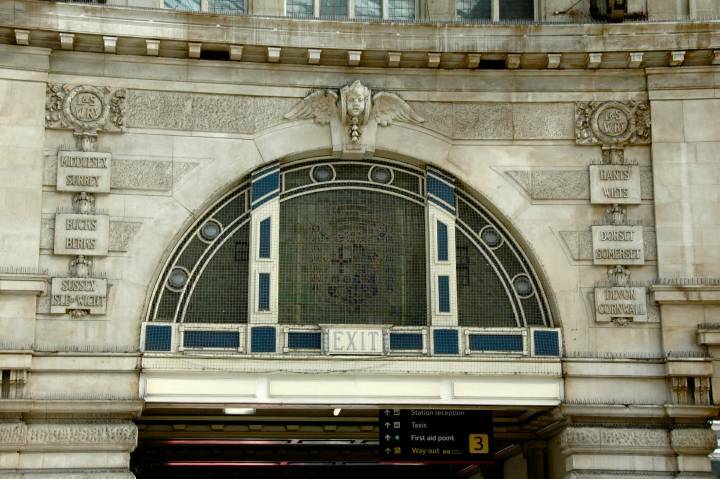 The first London and South Western Railway’s London terminus was at Nine Elms and opened on 21st May 1838. It was a modest neo-classical structure designed by Sir William Tite (1798-1873). It was his first station. 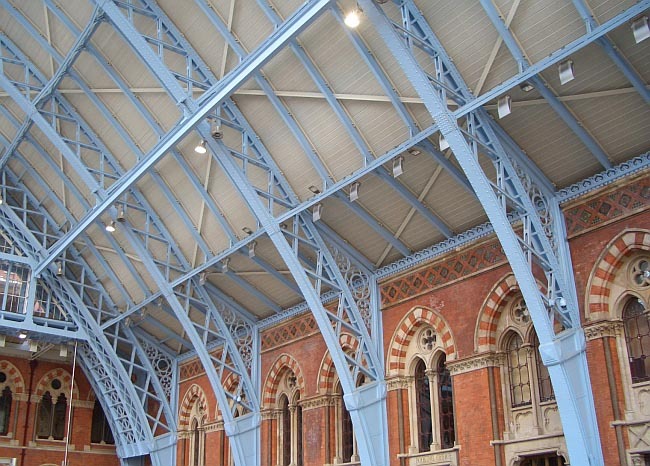 He had no inhibitions about style and Gilbert Scott admired some of his bold vernacular stations in the North. Steam riverboats took passengers from Nine Elms to London Bridge and other points on the North bank of the Thames. This arrangement caused fairly considerable inconvenience to passengers. 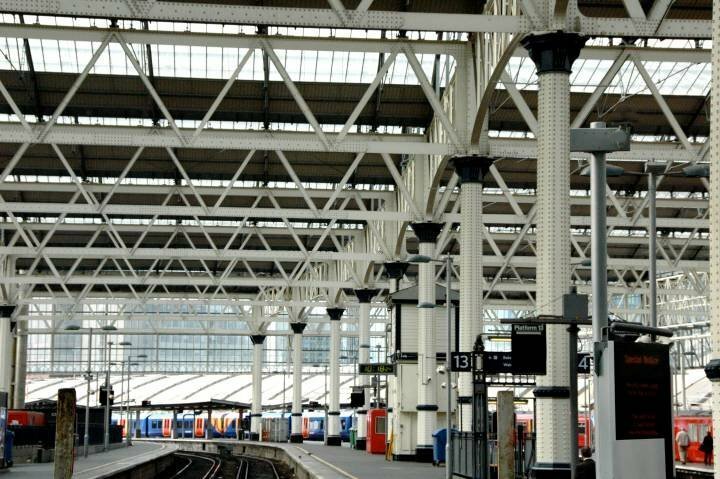 Waterloo Station was opened in 1848 — with two train sheds of 100 feet (30.48 meter) spans. The LSWR’s traffic passenger traffic increased exponentially as Waterloo served Portsmouth — and latterly Devonport (1876) — the great naval bases as well as Aldershot, the principal army base. There was also the huge increase in commuter traffic from Kingston, Surbiton and Richmond. By 1892, Waterloo was handling 50000 passengers a day. The LSWR had, incidentally, extended its services to Exeter in 1860 and, by 1899, Padstow in Cornwall. 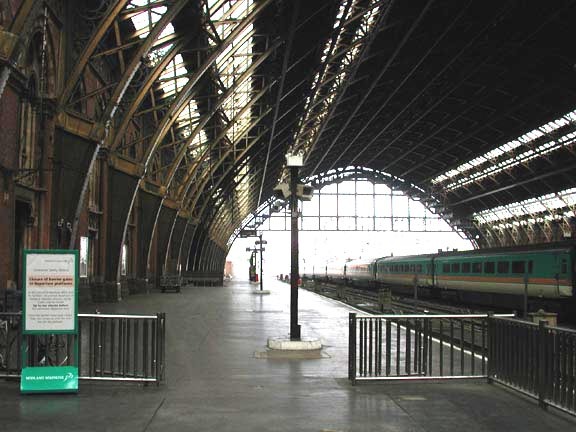 The station became noted for the difficulties passengers experienced in finding their correct departure platforms. There is a story — no doubt apocryphal — of a Devon farmer who declared to his wife “no wonder the French were defeated at Waterloo”. At the turn of the century the LSWR Board decided that Waterloo needed to be rebuilt and J W Jacomb-Hood, LSWR’s Chief Engineer, was sent to the United States to study contemporary station design. He was to be responsible for the structure and planning of the present station — although certain bays from the earlier station were retained. After the death of Jacomb-Hood in 1914, A W Szlumper took over. James Robb Scott, “Chief Architectural Assistant of the LSWR” was to be responsible for the architecture of the station. Nikolaus Pevsner in his Buildings of England. London, first published in 1952, had little time for Waterloo. Its steelwork was “sadly timid” and Robb Scott’s fa�ade was “spoiled by a hopeless position”. 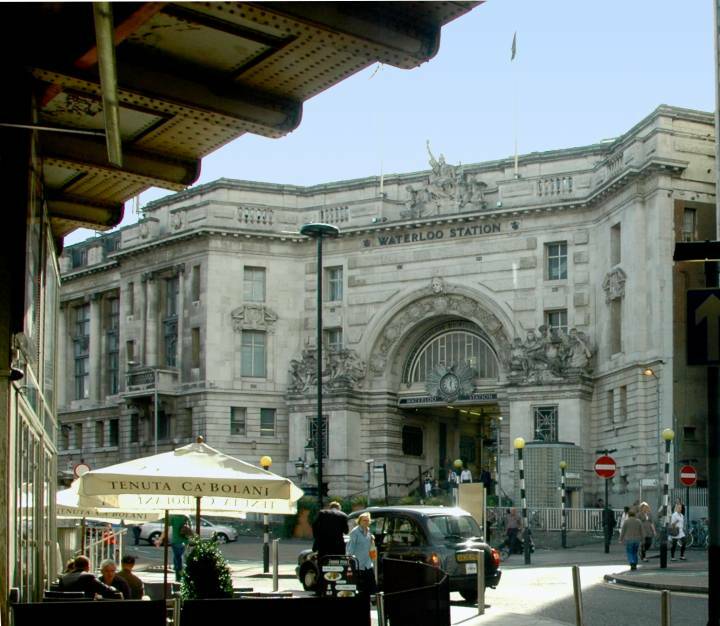 Indeed, the location of Waterloo has always been to its disadvantage — and, furthermore, it is the only great London station south of the river. Scott’s architecture is, for the most part innocuously late Edwardian. However, his triumphal arch is a splendid example of the style that has been described as “Imperial Baroque”. Sir Aston Webb (1849-1930) — designer of the Admiralty Arch of 1911, which commemorated the life of Queen Victoria, was the supreme exponent of the style. Pathetically ill-sited — but where else could it have been placed? — Scott’s arch commemorates the victory of the First World War. The names of LSWR employees killed in the war are recorded on plaques on the side of the steps, as are those of the Southern Railway killed in the Second World War. There are monumental statues of Bellona, the Goddess of War, and Peace flanking the steps. The arch is surmounted by a triumphant Britannia. Attached to the station — and sharing the concourse — is Waterloo International Terminal by Nicholas Grimshaw and Partners, which was opened in 1993. The design has been much admired. It has been said that it owes a little to Dutert’s and Contamin’s three-hinged Palais des Machines, at the Exposition Universelle, Paris 1889. 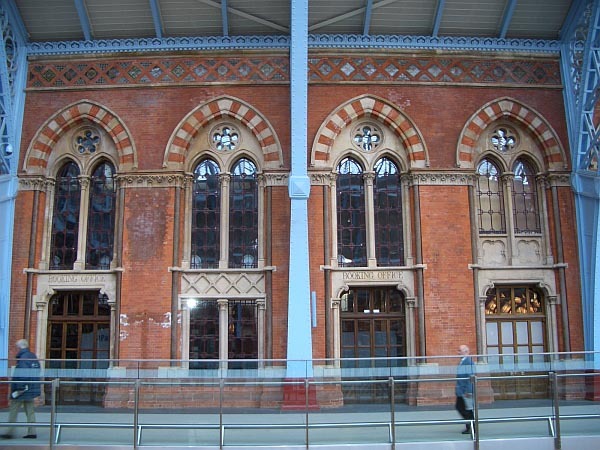 The International Terminal will cease operation when the new St Pancras opens, although it will continue to be used for ordinary train services. Waterloo, despite its architectural failings — in particular its vainglorious attempt at monumentality — is a pleasant and efficient station. 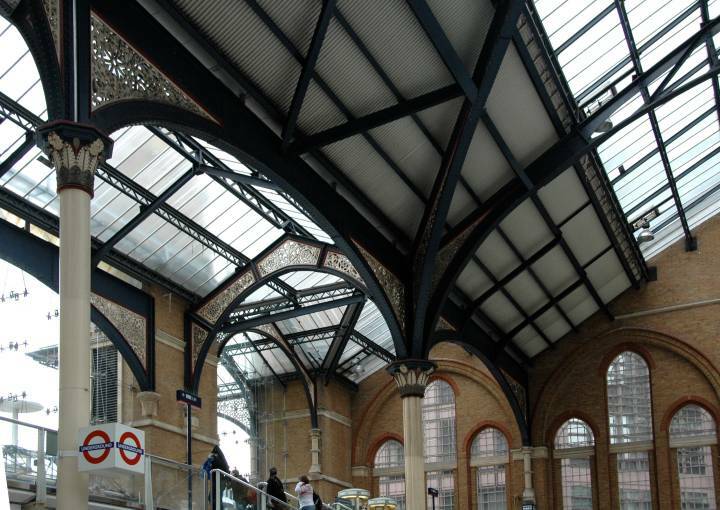 For all the lack of bravura of the scheme, the glazed roofs of Jacomb-Hood and Szlumper give Waterloo some of the best natural lighting of any station.